We provide our clients an extensive array of multiple colored Thread Bangles. Designed to perfection by our team of skilled craftsmen, these bangles could be adorned during any occasion, be it formal or casual. These thread rapped bangles are prepared from high quality material and designed as per the latest trends. 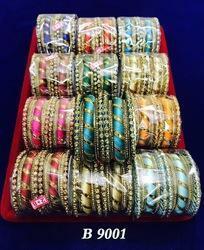 Our customers can purchase these bangles at most competitive prices. Manufacturer & exporter of silk thread bangle in multicolor, fuchsia silk thread wrapped bangle, silk thread bangles.Turquoise silk thread wrapped bangles. This bangle is so beautiful multicolored silk thread wrapped light and comfortable on your wrist that you won't even realize you are wearing them. - these handmade silk bangles are made with silk thread. - standard sizes :2. 4 (small), 2. 6 (medium) and 2. 8 (large). - available in all colours. Made of resham thread. Will neither shrink nor fade.